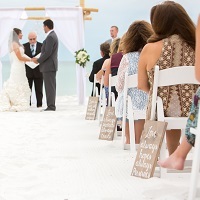 6 Hand Painted Rustic "Love Never Fails" Aisle Signs. *This selection includes Signs only. Additional décor pictured must be requested separately.